1. One wishlist per 24 hours. 4. Be aware of the forum rules made by Gary,Greg, and The Vikings. 5. Please keep your Thank you's to your Angels Private message or to your Angels Home mail box. I have had several complaints that people are taking up to much space on their post with everyone's angels with thanking them. Just trying to make it a little easier for people to go through wishes. 6. No Rudeness.If you are rude you will be banned from posting in my thread. 7.Do not copy someone elses wishlist. If you do not know how to make your own you can ask some one to make you one or have someone explain to you how to make one. 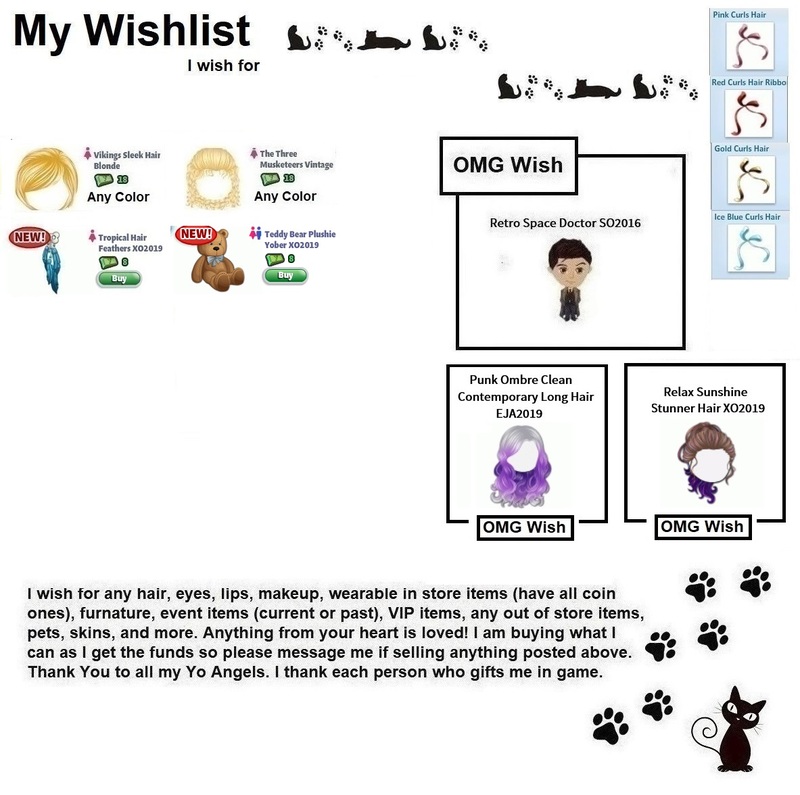 But stealing someone elses wishlist is now against this threads rules. As it is extremely rude to do and it is also against this threads rules on being rude. USE YOUR MANNERS. As I know everyone here has them. 8.Please keep Wish list at a minimum. Written or Picture maximum number of items not to exceed 30. Not a rule but just a suggestion. If you want to and to make it easier on some of the gifters. If maybe you might think about adding the page number your wish list is on. I do understand especially if you are an anonymous gifter. But like I said it is just a suggestion not something you have to do. Enjoy this thread and remember, saying thank you goes a long way! Last edited by KimmieStarDreams (14315228) on Mon Feb 11, 2019 7:09 pm, edited 1 time in total. Thank you so much to Greg PAW for the white Christmas angel sash! Thank you so much to Yoyo for the black angel sash! Thank you so much to SilverFoxy for the black rose earrings! Thank you so much to KimmieStarDreams for the red doll earrings! Thank you so much to Chaotic for the huge pool! Thank you to Ayuki for the Golden Egypt and YoAir items! Big extra Thank You to YoBreezy for the surprise gifts in my inbox! Truly shocked me! Thank you so much to Dia for the outfit giveaway items! Last edited by MsPhantom (129173078) on Tue Feb 12, 2019 12:43 am, edited 4 times in total. Posting my wishlist and off to gift! Last edited by Anna Del (1251882) on Tue Feb 12, 2019 12:38 am, edited 2 times in total. Last edited by Dia (182313813) on Tue Feb 12, 2019 6:54 pm, edited 1 time in total. I do gift when possible. Thank you and have a great day !! Last edited by LiL MaMa (149099631) on Mon Feb 11, 2019 9:08 pm, edited 2 times in total. Last edited by JustJo (106622274) on Mon Feb 11, 2019 10:33 pm, edited 1 time in total. Last edited by Anna Del (1251882) on Tue Feb 12, 2019 12:19 am, edited 2 times in total. Last edited by Greg PAW (105652472) on Wed Feb 13, 2019 7:46 pm, edited 2 times in total. Tonite, wishing for any of these cuties! ! Also wishing for any of the New Handhelds from this theme , New Face case features, & NPC’s(I collect all NPC's) from this current theme Carefree 50s!! And as always gifts from the heart & surprises are loved & appreciated! Tysvm in advance for looking! Please take the time to thank your gifters in their inbox & as well in the official “Thank You” thread! The official thread speaks volumes & not just your inbox; I check that regularly! A little appreciation goes a long way! Last edited by SamiSpiffy23 (138400888) on Sat Feb 16, 2019 11:25 pm, edited 3 times in total. 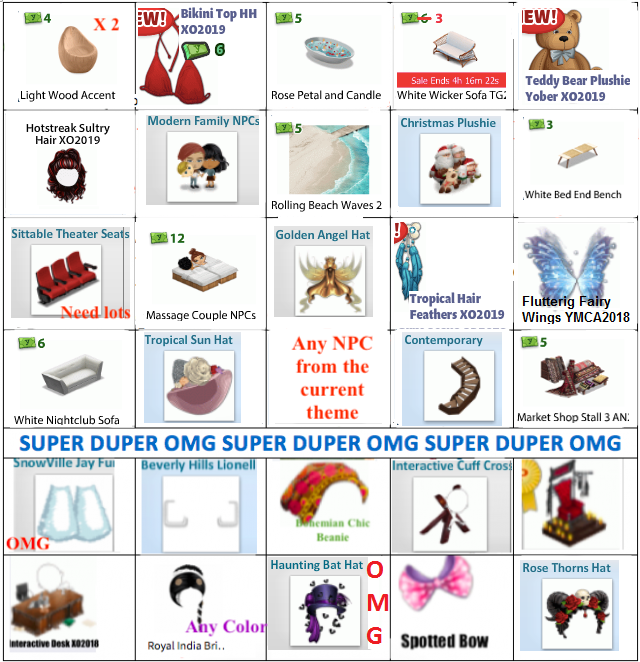 This is my OMG list. Anything at all is so very appreciated! Thank you Greg PAW for the casino items! Thank you Anna Del for the kitchenette!! Thank you ChAoTiC for the hair!! 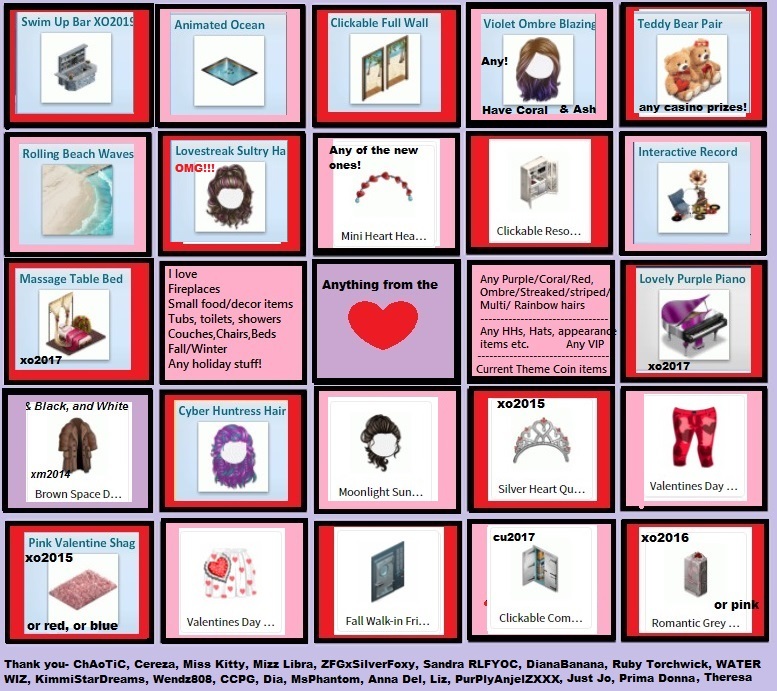 Thank you Lil Mama for the valentines items!! Also wishing for any of these, the pup is so cute! i got distracted watching Greys on Netflix...Oops!Off to gift now! Last edited by SamanthaB (138856291) on Tue Feb 12, 2019 2:19 am, edited 2 times in total. Last edited by Butterfly (111936444) on Tue Feb 12, 2019 7:36 pm, edited 1 time in total. Last edited by ChAoTiC (160142421) on Mon Feb 11, 2019 8:30 pm, edited 1 time in total. Last edited by Ash (142515693) on Mon Feb 11, 2019 9:40 pm, edited 2 times in total. Last edited by ZFGxSilverFoxy (10296439) on Mon Feb 11, 2019 8:14 pm, edited 1 time in total.